Bravo to TFC and downtown Ithaca. And thanks to you BC for the update. Thanks for the heads up Ex, I didn’t know they had updated the agenda. I was expecting to write about the residential project at 215 West Spencer, but it seems the developer decided to hold off from presenting this month. I believe (but haven’t confirmed) that the current bank drive through was once the location of the Cornell Library, back before there was a Cornell University. Pictures of the grand building are easily located online. It was torn down in 1960. 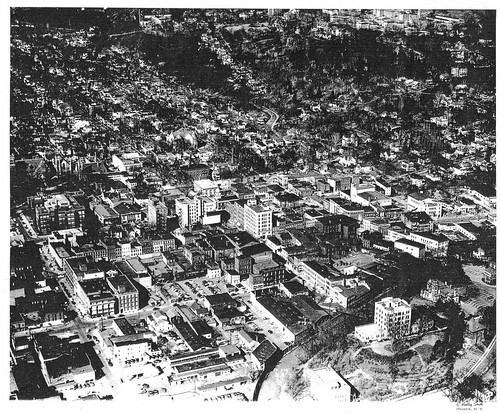 Urban Renewal. 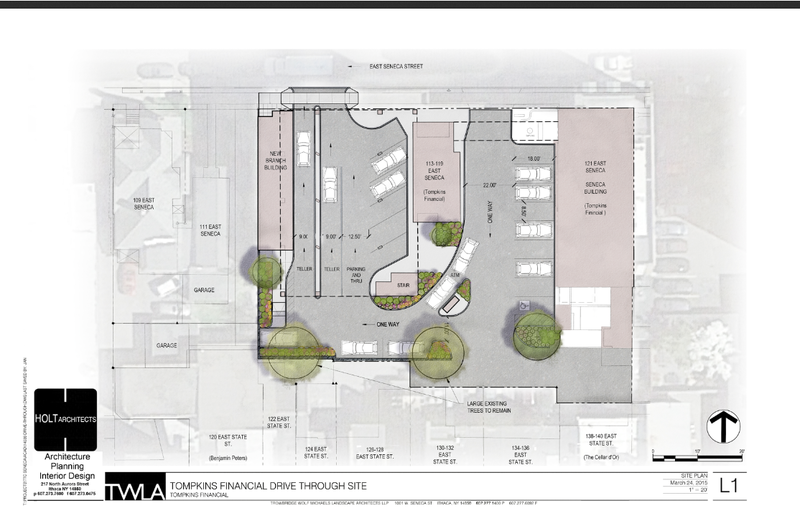 The current asphalt lot is the dramatic improvement planners were hoping for? Perhaps this latest proposal will fix that mistake. Close. The Bank of America ATM at the Tioga/Seneca intersection was where the Cornell Library once stood. The county assessor’s page says the drive-thru for TTC was built in 1990, and the previous site owner was an entity called “Cornell Theatres”. Then they should be building something at the Tioga/Seneca intersection damn it! This should definitely be a priority. 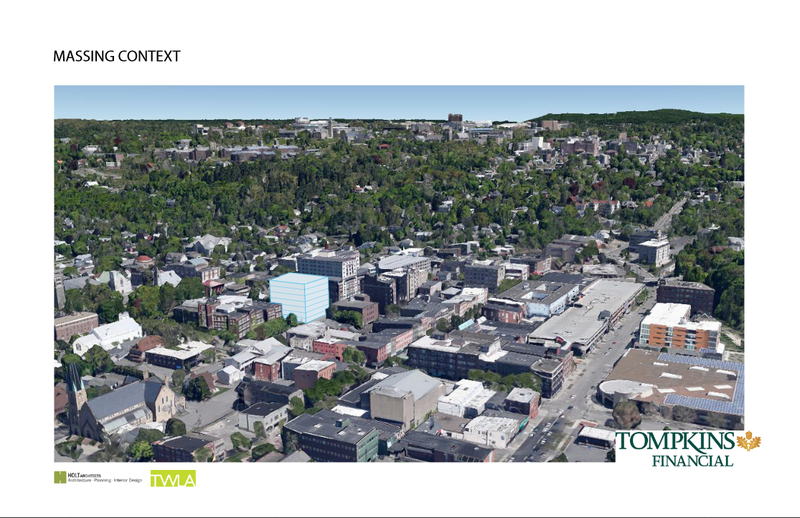 I’ve long fantastized about it being a nice, slim centerpiece of the Ithaca skyline, nestled as it is among neighbors with little reason to object. A mixed-use building taking advantage of the transit hub just across the street would do the trick: 10-15 stories with a little crown. I like that idea. But given the number of complaints on the Voice article about there not being enough parking in downtown, anything on that site would be a tougher sell to the general community (then again, the commenters might just be the squeakiest wheels – it’s hard to think of a local development proposal that hasn’t received a complaint of some kind). I just did a quick check of county records – Jason Fane bought the lot (official address 203 East Seneca Street) in 1996 for $3.55 million. Given his reputation, he himself would be another liability. The location use to be occupied by the Temple Theater. I believe there was another bulding next door to the Temple which was associated with Ithaca College (a gym or small auditorium?). I use to walk by them on my way home from DeWitt Junior High. btw, I was wondering how this TFC move will affect the old Seneca Building across the street. I’m assuming TFC occupies much of that building. Maybe the Seneca Building could be converted to apartments. The aerial photo is marked as private. Is there a way to make a copy of it public? Just came across this photo earlier. Temple Theater is on the left. Hard to say it’s not a positive development overall, though in an ideal world it’d be dense downtown housing with maybe a couple spots for restaurants at the bottom (lacking vs. generic retail space downtown, apparently) while Tompkins consolidated into one, taller building. The street feels a bit like a Tompkins Trust ghetto in parts already as it is. That touches on one of my concerns – is TFC vacating any of its old space? The market for office space is pretty weak, and putting more on the market would worsen the problem. 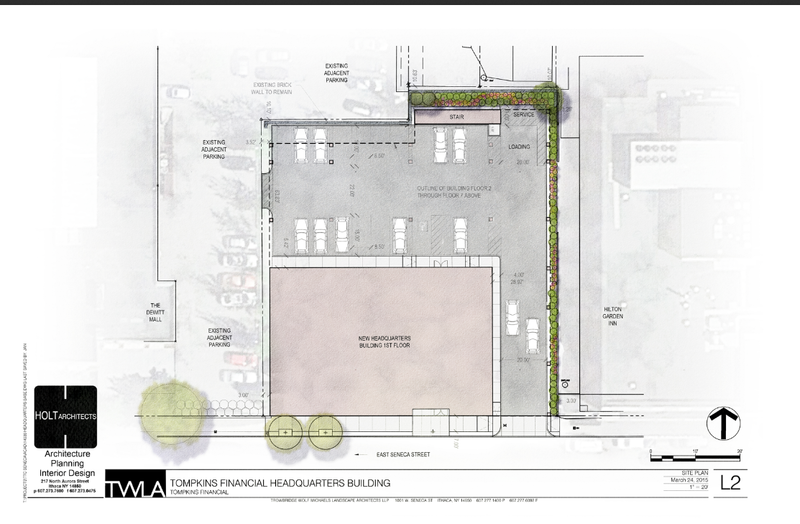 The Harold’s Square project on the Commons is struggling to get a construction loan because of a lack of office tenants secured for its second floor. Although, as Ex-Ithacan mentions above, the ca. 1929 Seneca Building would make for a tempting residential conversion to larger/more experienced developers. BC, sorry for the mix-up with the photo. Should be fixed now.